31 Nights of Halloween - Night 31 HAPPY HALLOWEEN! It's been so much fun celebrating with everybody all month long. 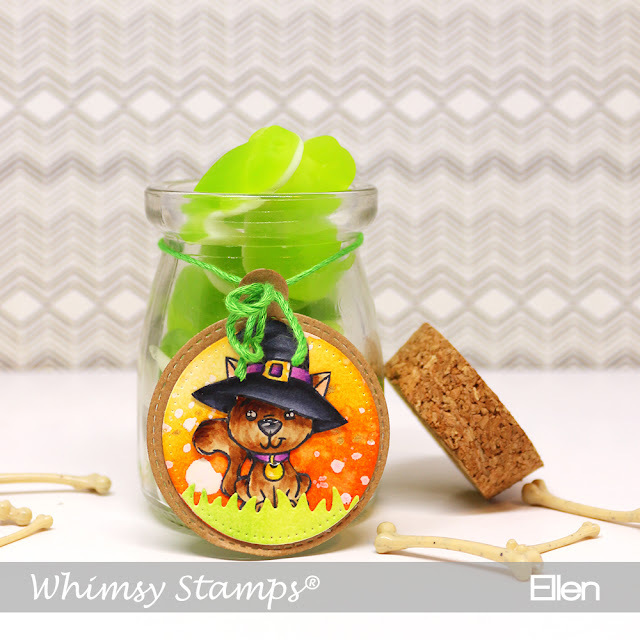 Thank you for all your comments, posts and support of Whimsy Stamps we appreciate each and every one of you and hope you had a great time too! 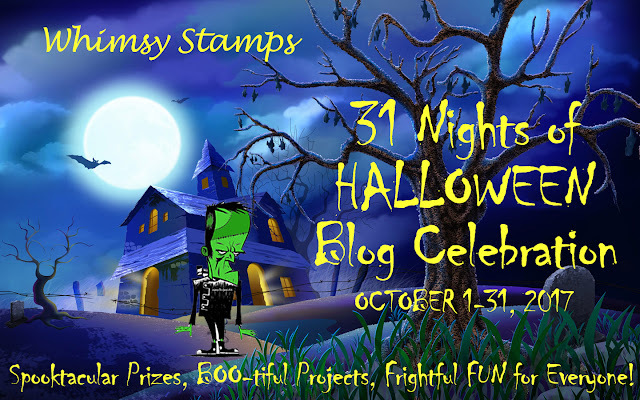 31 Nights of Halloween Whimsy Stamps Blog Celebration post on Halloween night! And I get to announce ALL the winners of ALL the prizes tonight too! 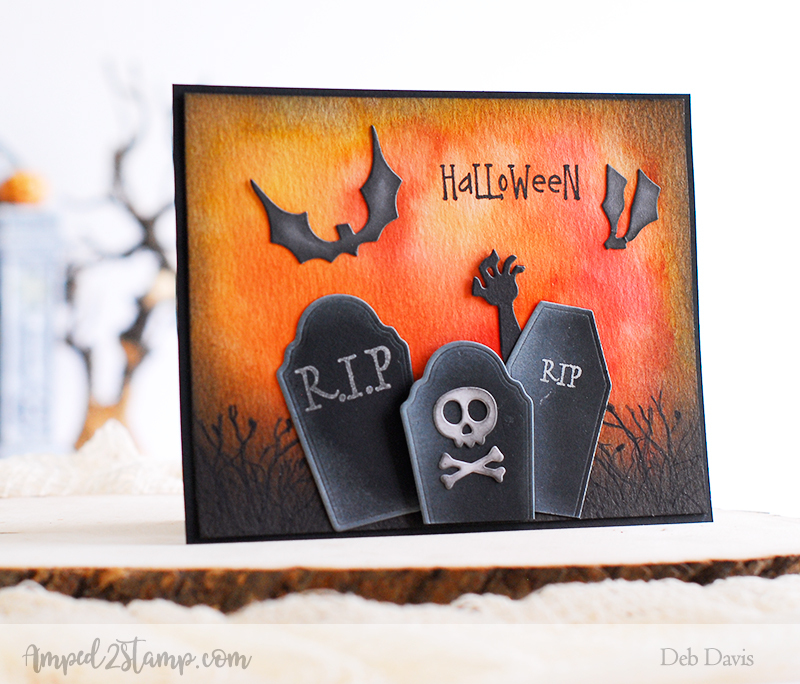 For more pics and additional details on this Halloween card visit my Amped2Stamp blog. 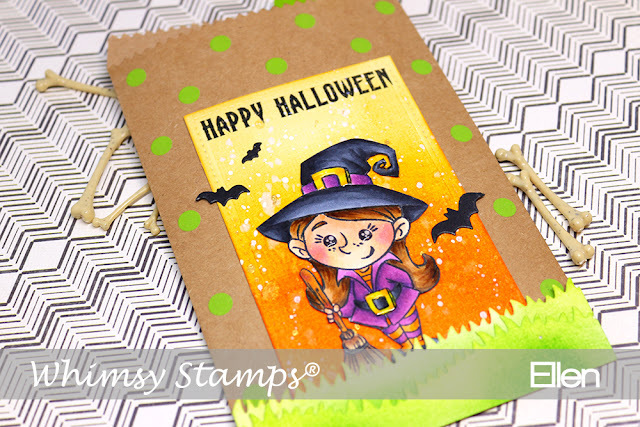 I hope you all had a great time with the Whimsy Stamps 31 Nights of Halloween festivities and that you'll come back and share often! Below are ALL the WINNERS from our month long Halloween celebration. Night 25 - 25% off ALL Halloween products thru 10/31/17 - for EVERYONE! Be sure to come back tomorrow and all this week for sneak peeks at our awesome new release for November, I think you're gonna like it ;). 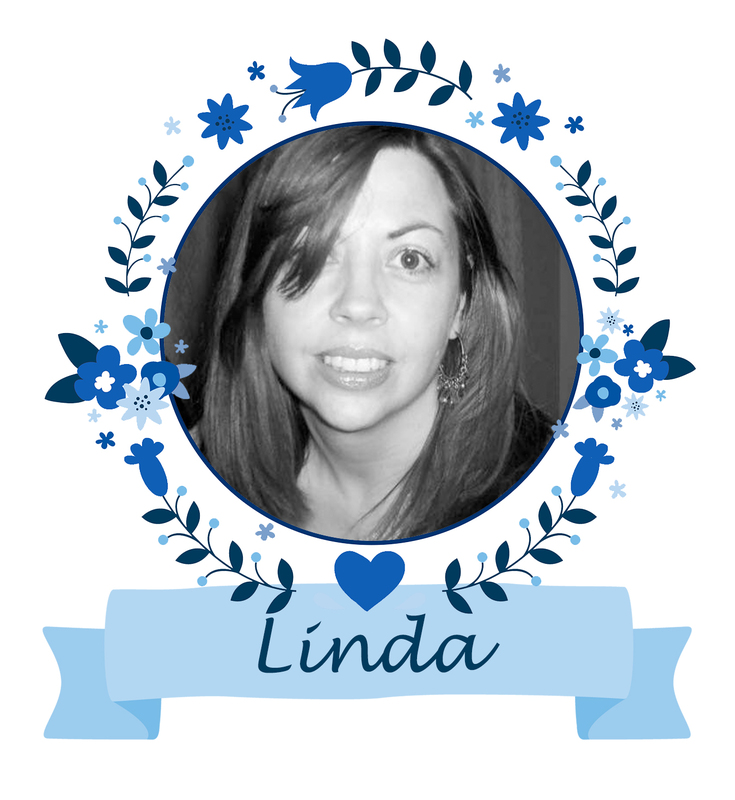 Hello Whimsy Friends! 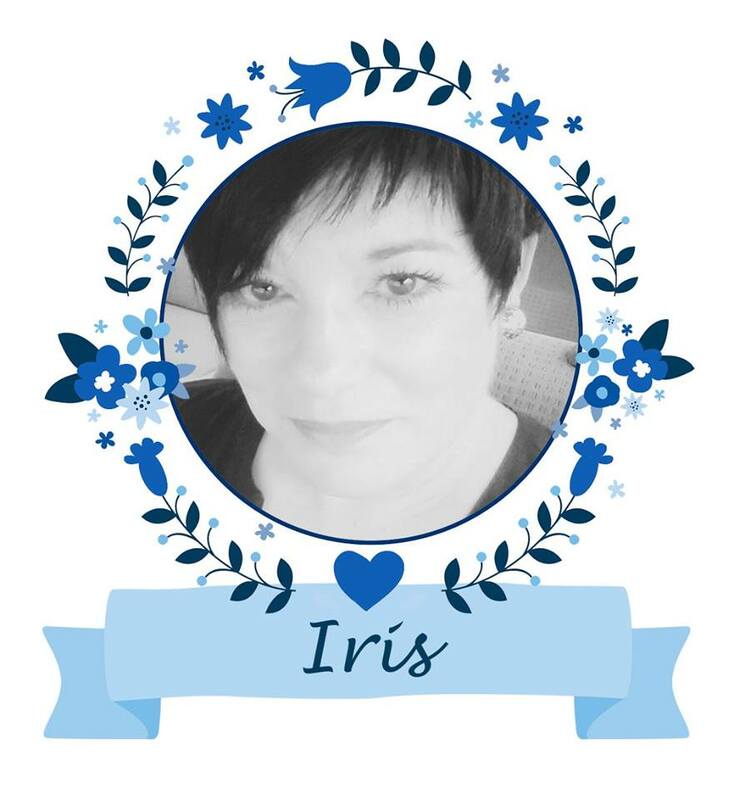 It's Iris here again with my second creation for our 31 Nights of Halloween. It's the last night before spooky times arrive! You better get ready and be prepared! 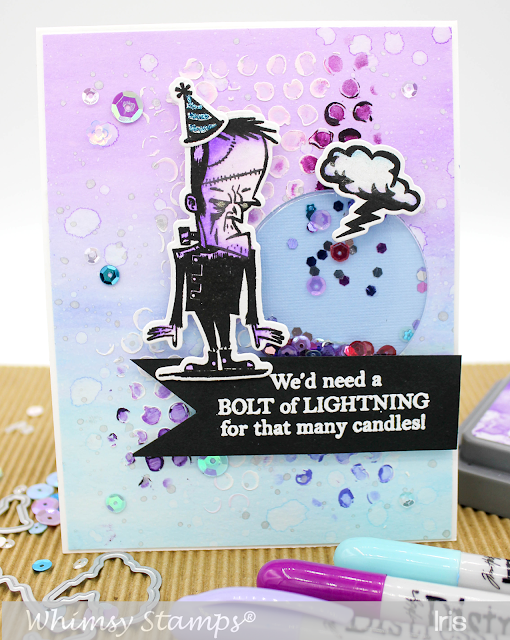 This time I have a birthday card to share using the awesome 'Franken Schmutz' clear set by Deb Davis. I love this Franken monster, he is so cute. I also like that this set can be used for a variety of cards, it really is versatile! I decided to go with blue and violet colors and also include a little shaker circle. The background was made using Distress inks/crayons in tumbled glass, shaded lilac, wilted violet and seedless preserves. First I applied a color wash with Distress inks and let it dry. 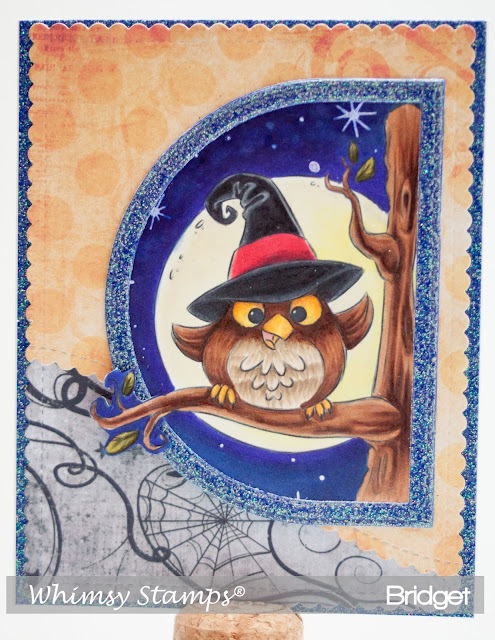 Then I used a Tim Holtz stencil (Bubble) and Distress Crayons to add some texture to my background. Some spritzers of water finish off the background. 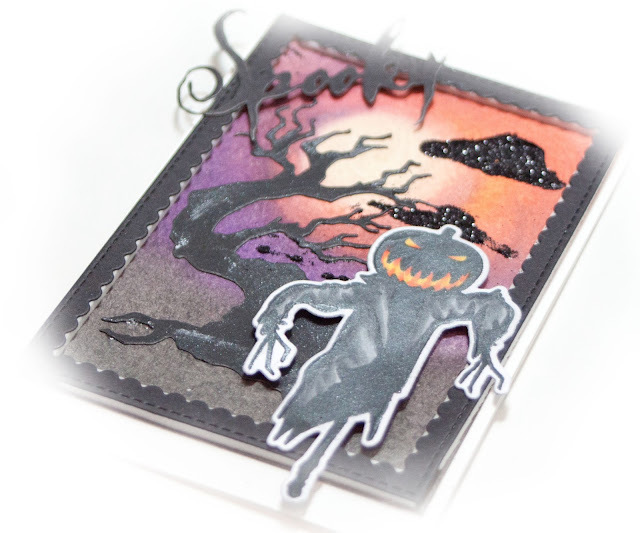 All the elements were stamped with VersaFine black ink and cut out with the matching Franken Schmutz dies (sold separately and not included with the clear set). 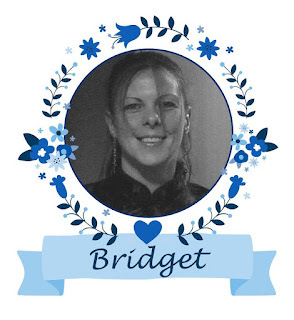 The sentiment is included in the clear stamp set and was stamped with VersaMark ink and embossed with white detail embossing powder. As I always need some glitz and/or bling on my cards I colored his eyes with a silver gel pen and used sequins not only as shaker filling but also to embellish the card. I used sequins from my stash as well as Painted Garden Sequins. They match wonderfully with my card. There is still time left to participate in all our games and have the chance of winning some spooktacular prices! Thanks for stopping by and make sure to come back tomorrow when we're approaching the witching hour and winners will be announced here on the blog! Thank you again for letting me share in all of this Halloween fun. 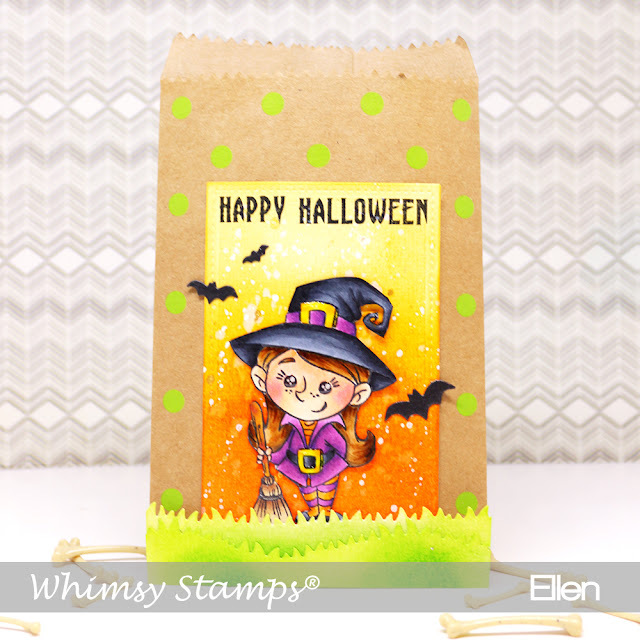 I have had such a wonderful time guesting for WHIMSY STAMPS these past couple months! 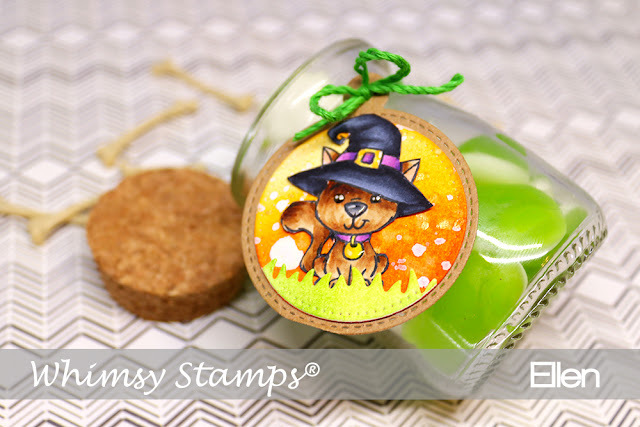 Be sure to check back tomorrow night for more Whimsy Stamps Halloween festivities, we're approaching the witching hour. I hope you're enjoying our 31 nights of Halloween spooktacular! We're almost to the witching hour, just 3 more days to go. Now when you look at my 'Halloween' card, you'll see that it actually has a birthday sentiment on it. 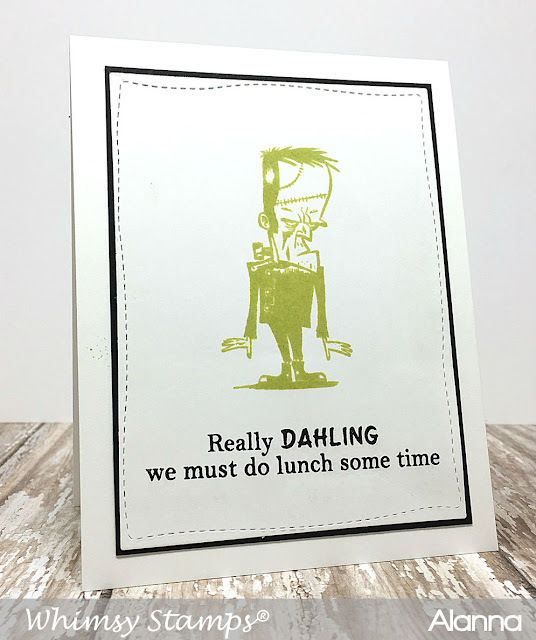 This is because in the UK we don't really send Halloween cards and our Halloween celebrations are really not so spectacular as over in the USA. However, people DO have birthday's on or around the Halloween celebration, so this still counts as a Halloween card right? 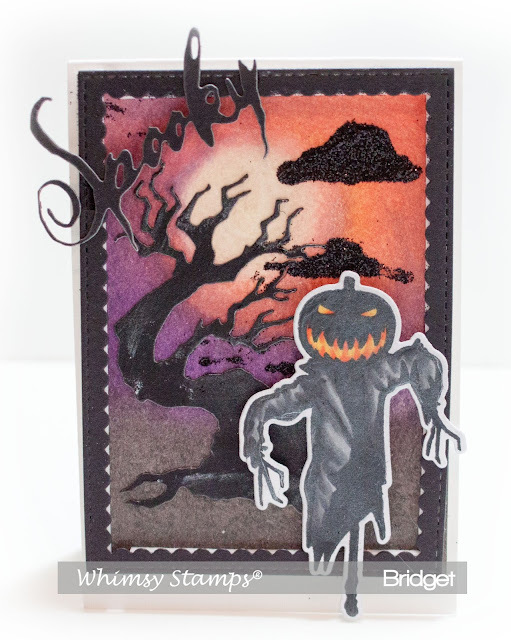 I really wanted to give my card a fab spooky background, so I used my Distress Oxide inks to blend a moody night sky lit by the moon's glow, masking the moon and then colouring in later with a mix of Distress Oxide ink and a couple of grey toned Zig markers. 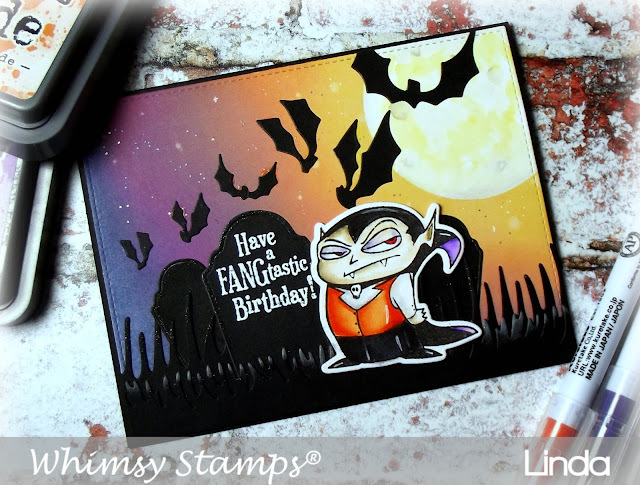 I coloured my vampire to coordinate with my background, with Zig markers and cut him out with the matching die. I die-cut the rest of my elements from black card stock, heat embossing my sentiment in white on top of my large gravestone and assembled my card. I added a little ink and some Wink of Stella to some of my elements to give them a glow and sparkle, and added some dots of white pen and glitter pen to my sky to look like stars. I mounted my panel onto a plain black card base and just like magic (black of course) my card was complete. 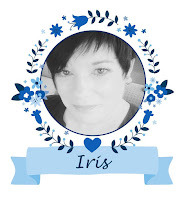 I've added all the Whimsy products used below, with links to the items. 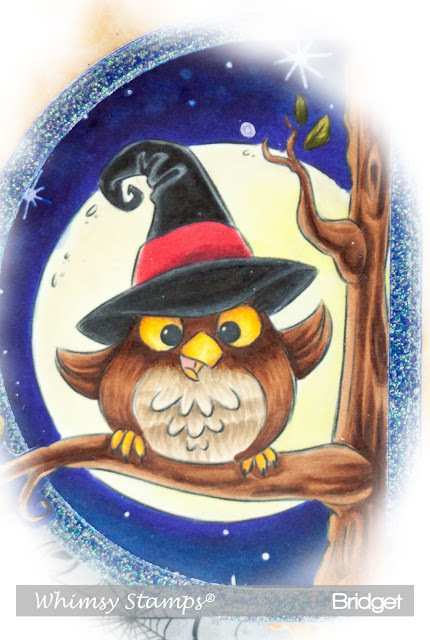 I have a prize to giveaway today, so for the chance to win please visit my blog by following the link here and leave me a comment telling me what you usually do to celebrate Halloween. You have till the 30th October to enter, and the winners will all be announced here on the 31st. Don't forget to keep checking back here every night for more Halloween fun and giveaways! 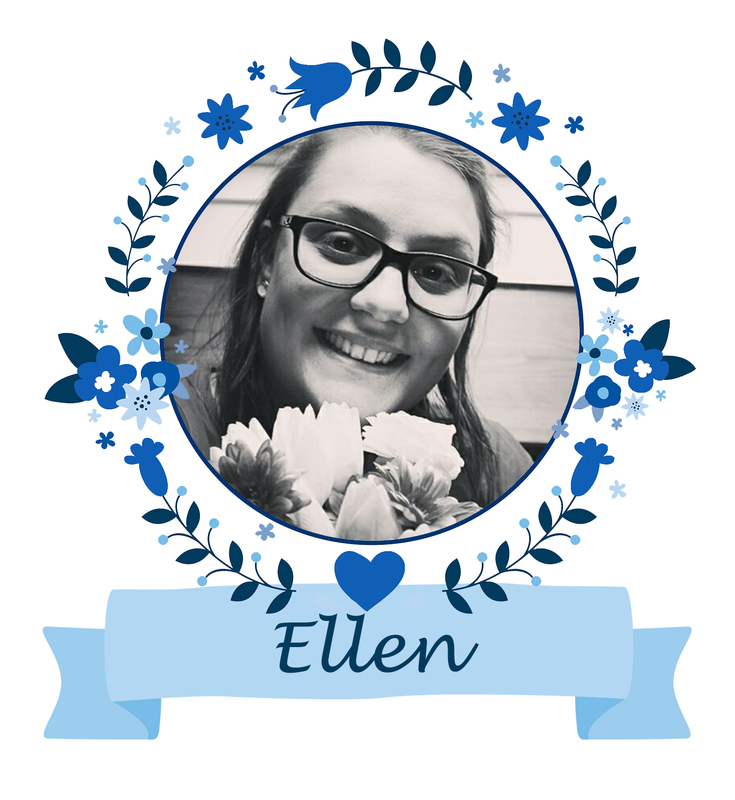 Happy & spooky Friday, it's Ellen here. Today it's my turn to show you something special. I didn't see some treat bags yet, so I thought that was the perfect moment show some ideas. The first bag I will show you a craft bag that I decorated the bag with the "Boo to You" stamp set and the "Dracula I Compel You" stamp and dies set. The rectangle background was created with distress ink, water sprinkles and white ink. The grass did go further than the square (that's what I wanted). On top of the square I placed the sentiment and of course my cute witch. At the end I placed the bats. The second item is a tag for a glass jar. The little kitten from the "Boo to You" is just perfect for a little tag. The tag was made the same way as the craft bag. I think this kitten is adorable and they go perfectly together as a witch-team, for sue when you use the same colors for their outfits. 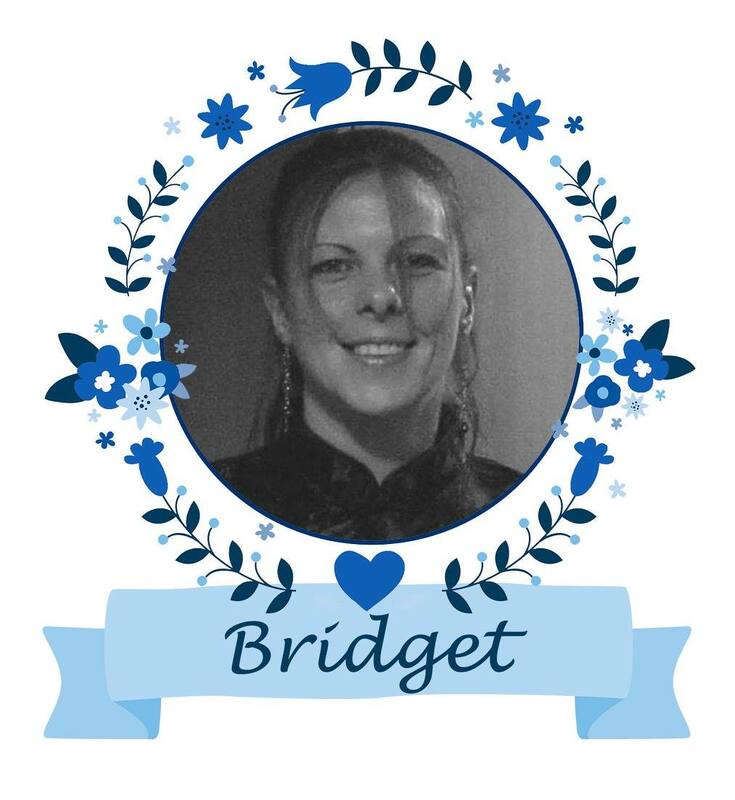 I hope you enjoyed my little post and be sure to check out all the other fun posts. Hi Everyone! Can you believe we’re already nearing the end of the 31 nights of Halloween? I decided not to make a card, as I don’t celebrate Halloween, but my grandkids do. So after scouring Pinterest I decided to make up some simple little bag to pop some candy. I used the Sleepy Hollow Stamp set and matching Sleepy Hollow Die set, along with the fab Haunted Halloween Digital Papers to make my little gift bag. The scarecrow is so easy to colour! Thanks for stopping by tonight, don’t forget to pop back tomorrow for more spooky fun. 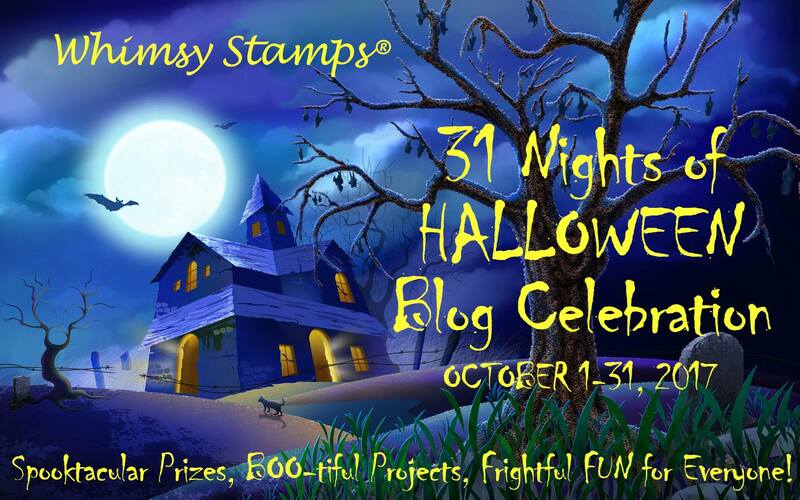 Welcome Whimsy fans to the 25th day of our 31 Nights of Halloween Blog Celebration. All month long, we've been showcasing super fabulous Halloween cards to help inspire you. I hope you've been enjoying this fun blog event. Alanna here and I'm happy to be here for day 25. For my card today, I am using the super fun Franken Schmutz stamp set. 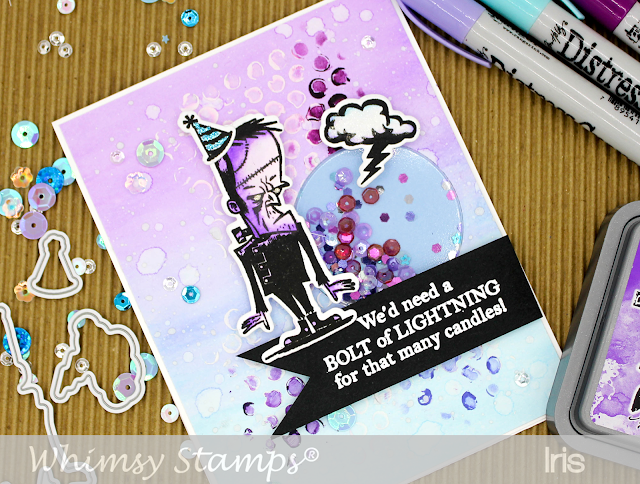 Note that there are also coordinating dies for this stamp set but I didn't use them on this card. I love all the fun sentiments included in the stamp set and that it doesn't have to be used only for Halloween. 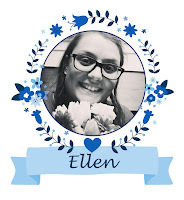 I thought it would be fun to make a card to send to a friend to let her know that a lunch date is needed. It also serves a dual purpose to wish her a happy Halloween on the inside as well. I stamped the image and then added a couple of the super cute sentiments. I then die cut this panel with the second to largest dies from the Hand Stitched Nested Rectangle dies. And here is the inside of the card. 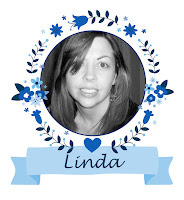 I stamped the sentiment and then stamped the fun image again, this time in a light grey ink. are you all ready and excited for Halloween. 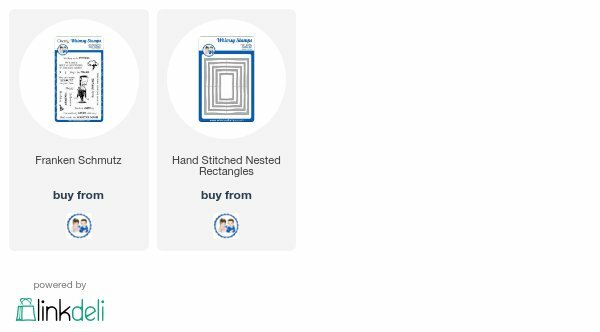 I have a couple of cards to share with you lovely peeps today. 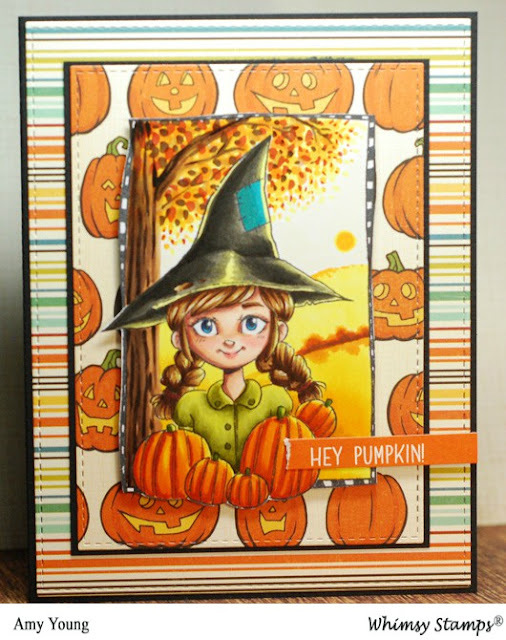 are from Halloween 1 and 3 digital papers. Faber and Castel Gelato's, I was going for a creepy misty moon effect. to place over the moon. 31 Nights of Halloween Night 19 and a GIVEAWAY!